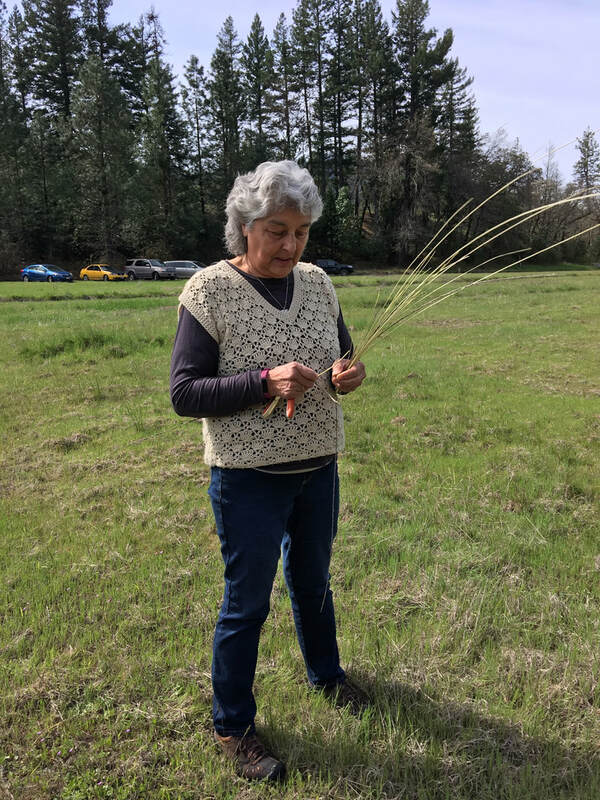 This week, we hear from the Clarke's Education and Interpretation Committee that attended the yearly Basket Weaver's gathering in Happy Camp. 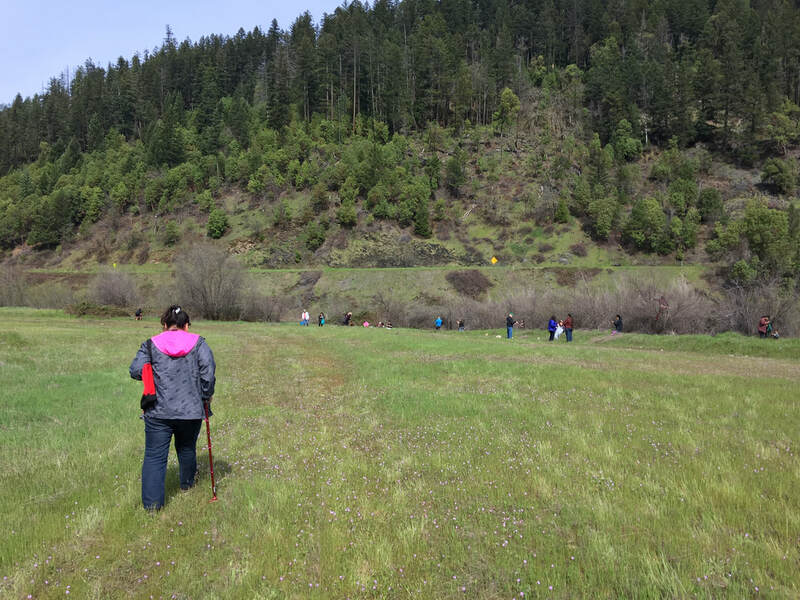 The trip was part of a series of trips the committee is making to reach out and connect with tribes and communities that are stakeholders in the work being done at the Clarke. 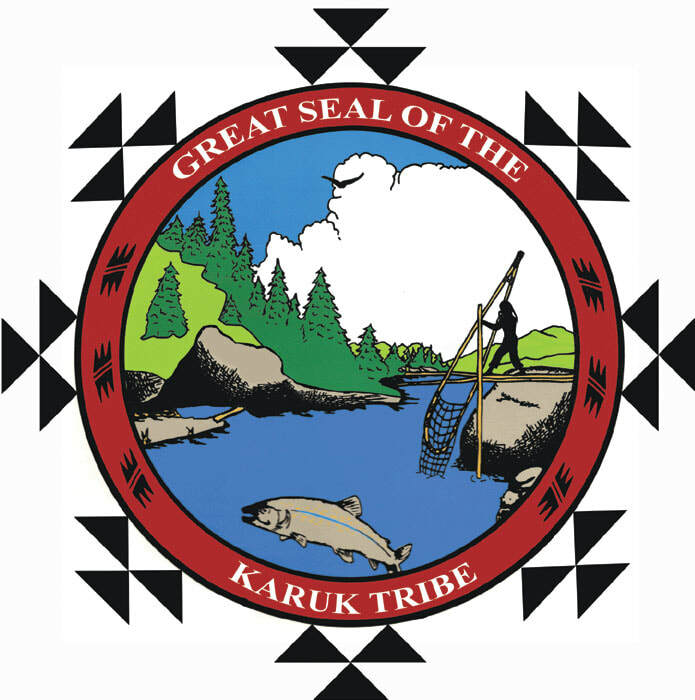 We were able to meet with members of the Karuk Tribe’s People’s Center Advisory Committee. The People’s Center is the Tribal museum and Gift shop. We were able to make inroads on cultural exchange ideas such as exchanging exhibit pieces (as permitted by our policies) and sharing photos and documents from a digital perspective in cases where original pieces cannot travel. We also discussed their digital library and the possibility of digitizing videos, CDs, etc. through cooperation with the Karuk Tribe. We look forward to collaborating with our tribal partners. At registration, we had some time to talk with Denna Dodds whose basketry work is currently on display at the Clarke. The weekend’s festivities then began with an opening prayer before a potluck dinner. It was sung beautifully by Jamie Peters, a Karuk tribal member. Dinner was followed by a night of Bingo fun, then everyone headed to their accommodations to rest up for Saturday. Saturday we all gathered for breakfast. It was interesting to hear all the different weavers discuss their current projects. After breakfast, we headed out to the nearby gathering grounds for willow sticks. 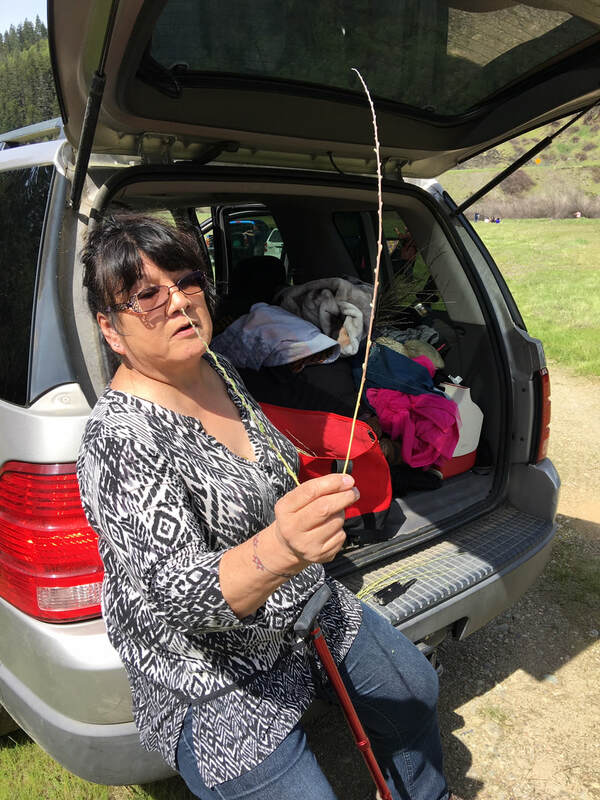 We learned how to choose the correctly sized sticks for the project that Shirley Laos, CHM Board President, would need for her current project. While finding and clipping off sticks from trees sounds easy, it’s not as easy as you might think. First, Willow grows in marshy grounds with lots of furrows. Some of the best sticks come from trees that may be more difficult to reach. We learned about the stage of budding that the tree should be in for the straightest, easiest to peel, and smoothest sticks. Once a tree is identified, you may have to bend down a branch to reach the sticks needed. Many women tuck the branch under one arm and cut with the other hand. The cut branches are put in a bag or bucket. Once you have the sticks you need, it’s time to peel them. Small sticks just beginning to bud are easier. Some have already begun to leaf out; those are more difficult to peel the bark from and may require smoothing with a tool or thumbnail. If you can’t peel them right away, the stick should have their base in a few inches of water until you can get to them. Once the peeled sticks dry out, they can be stored for later use. Shirley walks out to the gathering area. We had a great learning experience to share with visitors to the Clarke, and we made some new friends along the way. Thank you to Lynn Sturgis for writing this article, and Shirley Laos and Dina Fernandez for editing. Photos by Lynn Sturgis. Life at the Clarke: Volunteers! Volunteers play a huge role in day-to day museum operations and are very important to the long term operation of the Museum. In celebration of April as National Volunteer Month, I'd highlight some of our fabulous volunteers and the work they do here. 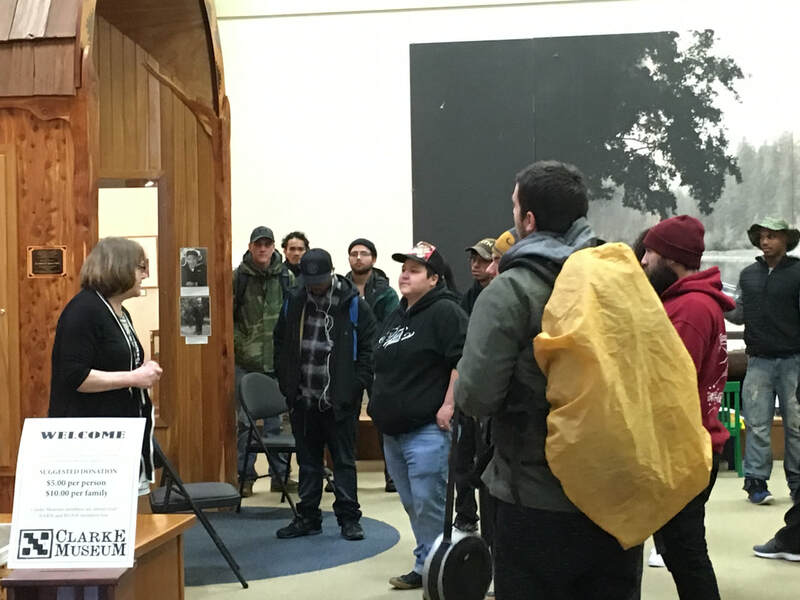 Leslie Reicke, who has been volunteering at the Nealis Hall desk for around 15 years, gives a short overview of Nealis Hall to a visiting group. Tour Guides are individuals who sign up to help lead school tours of the museum. Hundreds of local kids around Humboldt County visit the Clarke Museum every year to supplement their classroom learning. 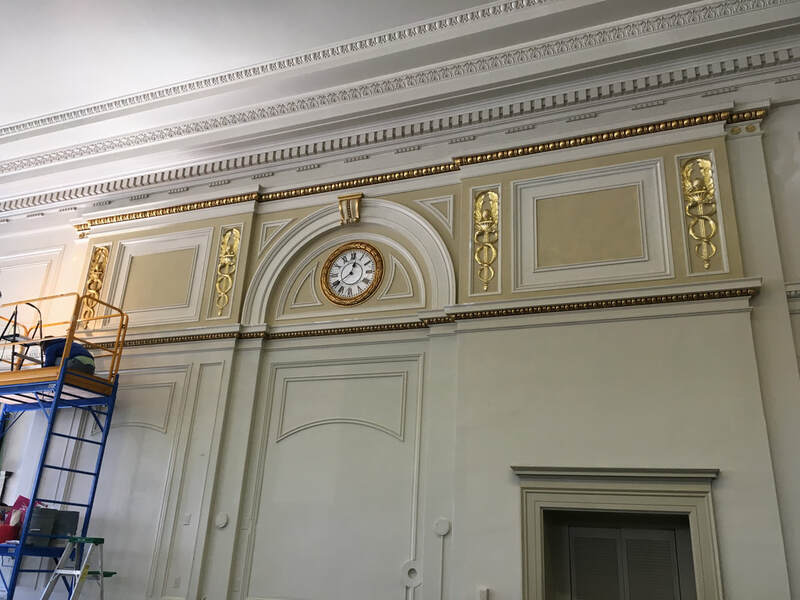 Docents usually lead tours of either the main hall or Nealis Hall, and at least two docents are needed for each class of kids who visit the museum. We are always looking for more docents to help out with tours. Introductory and ongoing training for leading tours is provided free of charge by the museum. 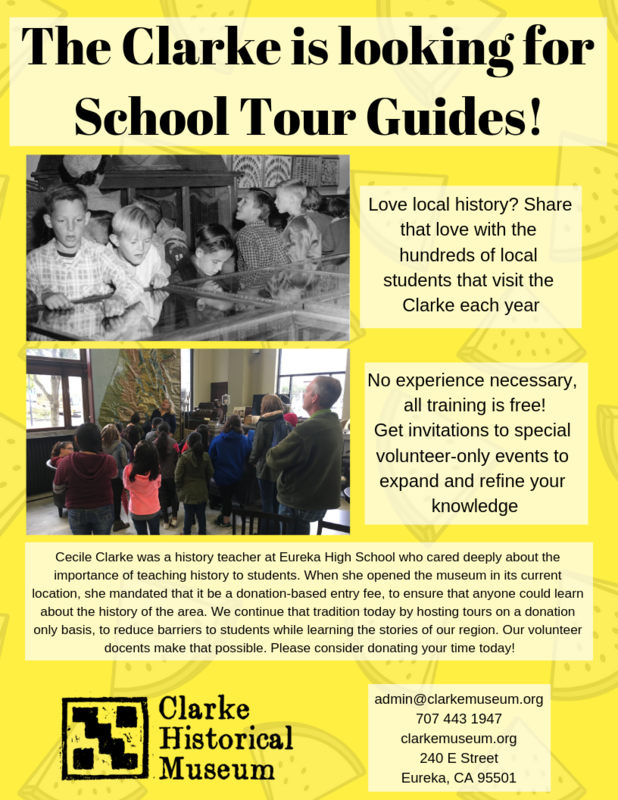 Contact us if you are interested in leading tours as there is a high demand for school tour docents every fall and spring here at the museum. 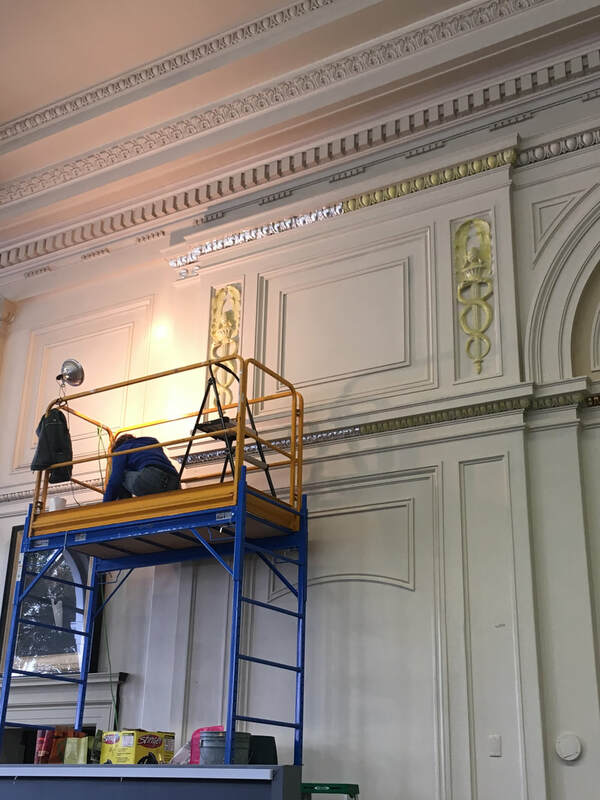 Each semester, we bring in a couple of interns to help with a variety of ongoing projects in the museum. 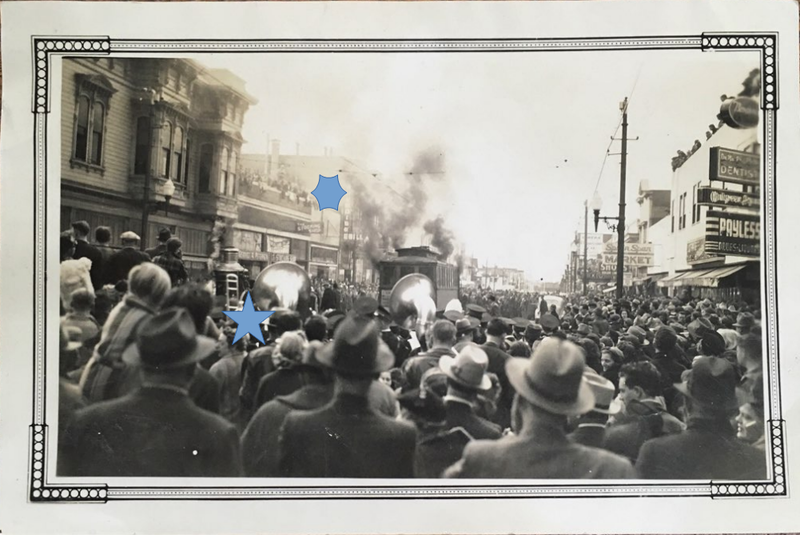 Intern projects have included improving our WWII memorial webpage, building a mini digital exhibit on early 1900s women's hats, and scanning the photo collections into formats for researchers and use within the museum. Intern projects vary from year to year and each intern project is designed with the intern's interests and goals in mind. Intern Sasha while she was helping with a new exhibit opening at the Museum. 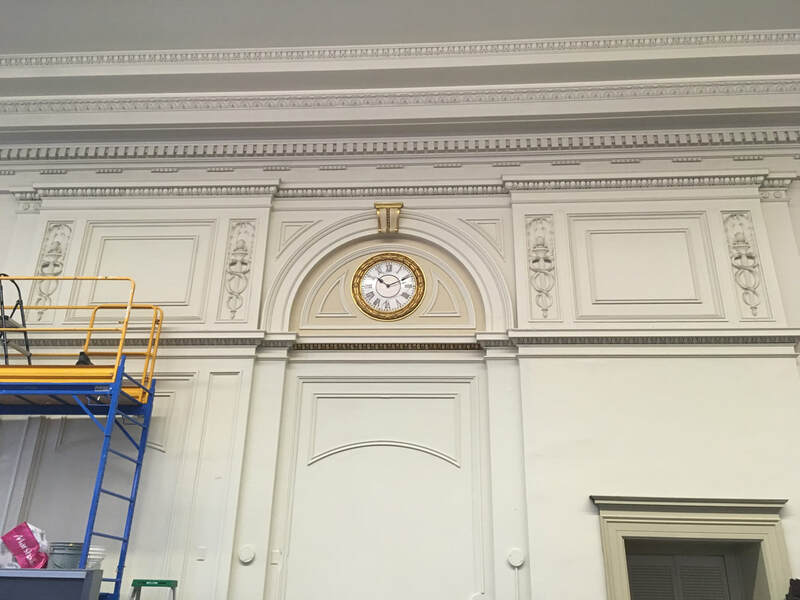 Want to help in the museum but are more interested in the behind the scenes work? We have volunteers who work organizing the archives, digitizing museum items, updating labels and records, documenting new donations, putting things away, helping with setting up and taking down exhibits, and researching items in the collections. If you have an interest in organizing or researching, this is the project for you! Intern and collections volunteer Shawna finishes rolling up a quilt headed to storage. How did our volunteers get their start here? I began volunteering at the Clarke Historical Museum in July of 2018 and I have been working on a project to catalog and relabel the museum’s rock and mineral collection. 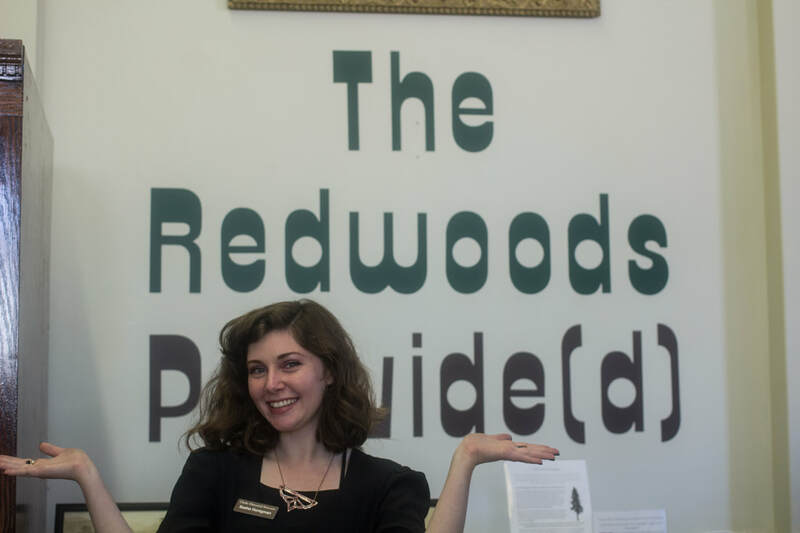 I found out about the opportunity during the opening of The Redwoods Provide(d) exhibit and through Katie Buesch, who is the Registrar-Curator for the Main Hall Collections. I also know Katie through the Religious Studies major at HSU—she is a wonderful volunteer supervisor and friend! This has been my first experience volunteering in a museum setting and I absolutely love it! 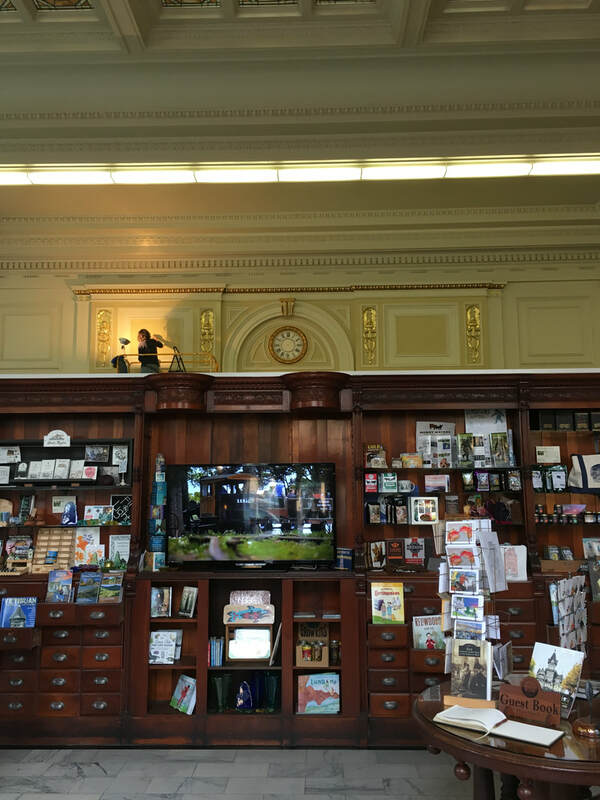 The staff and other volunteers at the museum are super kind and welcoming and it is really interesting to learn a bit about the museum’s collections and about some of the local area’s history. Also, working with the rocks and minerals provides an experience that is special to me, because I also majored in Geology at HSU and I feel that there is so much we can learn through studying rocks. Rocks carry with them a story that tells of their journey from their formation to how they traveled to the surface of the Earth and into our hands. And through the study of rocks (petrology), I have learned a bit about how to interpret and convey these stories. From my perspective, I would say that stories are inherent to the way that we, as humans, understand and interact with the world. I think it is incredibly valuable to have a place like the Clarke Historical Museum in our area to facilitate the sharing of various stories from the past and I feel lucky to have the opportunity to volunteer there! 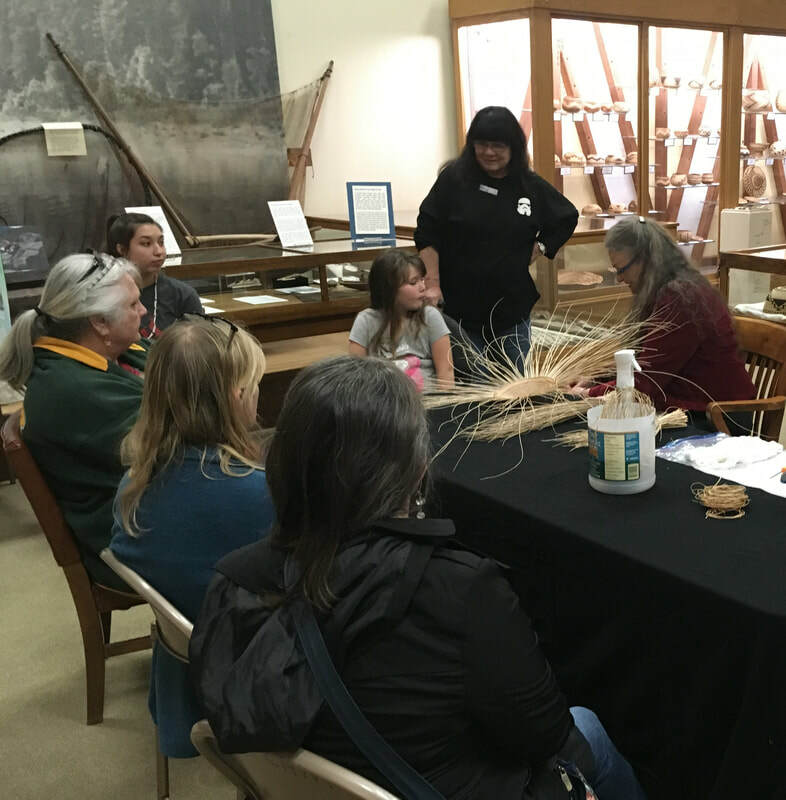 Volunteering at the museum is a great way to gain new skills, give back to the community, learn more about our area's fascinating history, and meet other people interested in similar activities. 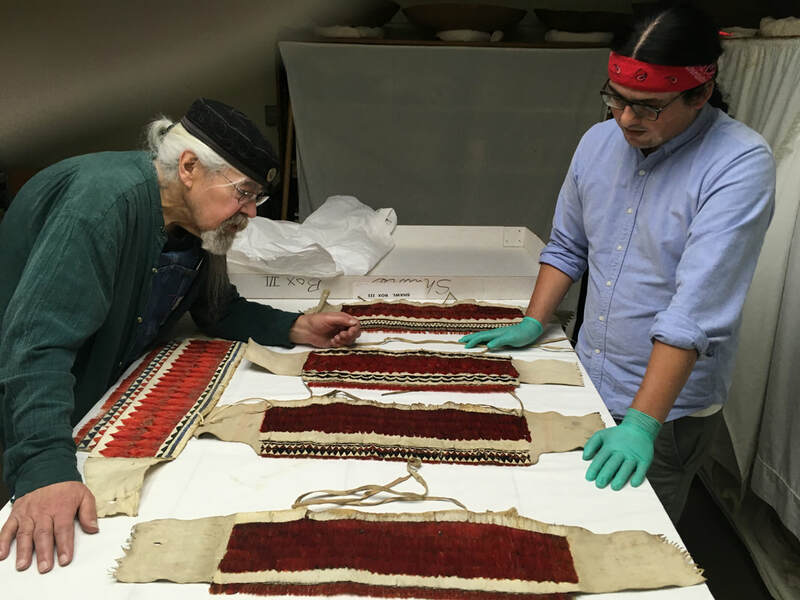 Former board president Gene Brundin inspecting recently danced Jump Dance headdresses (Yurok: Plegokw, Karuk: páathkir / pathkir, Wiyot: duraga'w, Hupa: me:wi-na:sita:n) with Gary Markussen Jr. Right now, we are most in need of additional tour guides to help with upcoming school tours. See the flyer below and feel free to contact us if you are interested in training. Never worked in a museum before? No need to fear-we offer all initial volunteer training and ongoing training for free. Join our newsletter to hear about upcoming training opportunities or become a member to help support our volunteer program! You can also visit our Volunteer page to learn more. 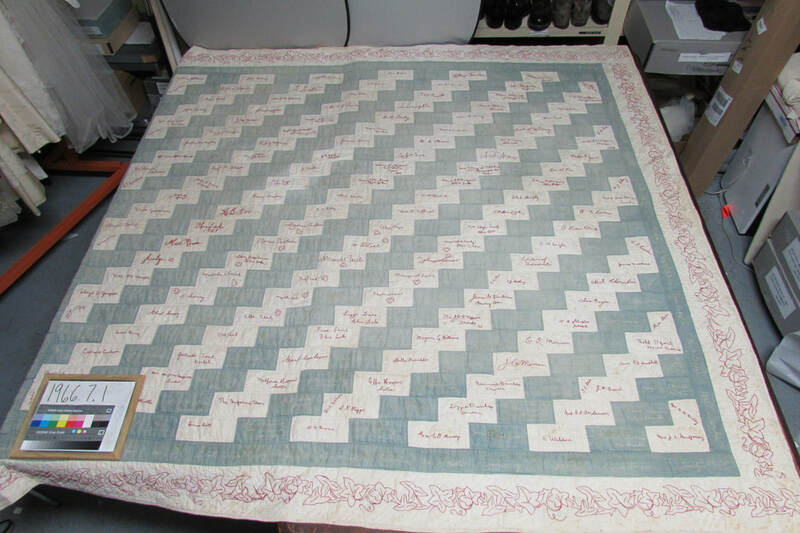 This week, We'll go behind the scenes at the Clarke to check out an ongoing project to preserve the quilt collection with the help of the Redwood Empire Quilter's Guild. Every two years, the Clarke hosts a quilt exhibit that coincides with the Redwood Empire Quilter’s Guild biennial quilt show, which is hosted at Redwood Acres Fairgrounds in Eureka. The Clarke has had a long relationship with the Quilter’s Guild, who host a fund at the Humboldt Area Foundation and have helped to fund a number of projects to support our quilt collection, including money for a custom case for the historic Grant Quilt and storage racks for our quilts while they’re not on display. 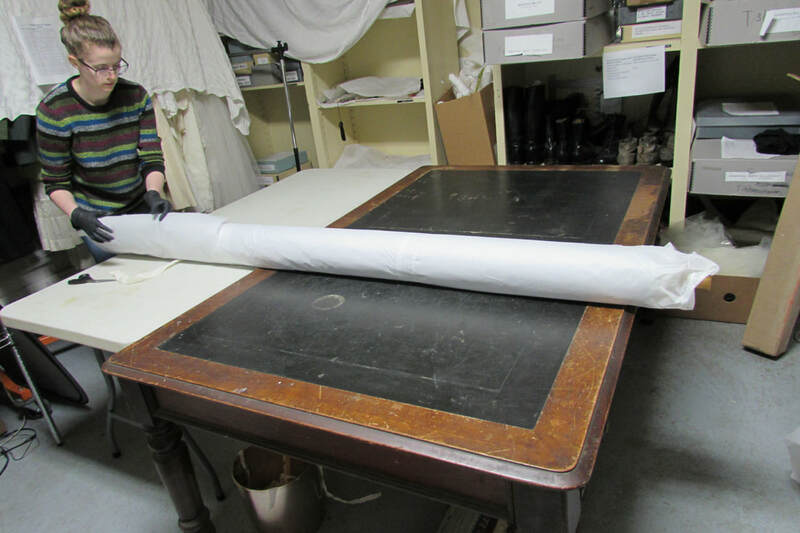 In 2018, we applied for and received a grant from the Guild to replace the archival tissue paper that the quilts are stored in. The tissue is replaced every 5 years to prevent damage to the quilts through acid accumulation. As the quilts naturally break down (as all things eventually do), they give off acids that, if concentrated, will accelerate damage to the quilt. Replacing the paper slows that accumulation of acids and helps preserve the quilt. 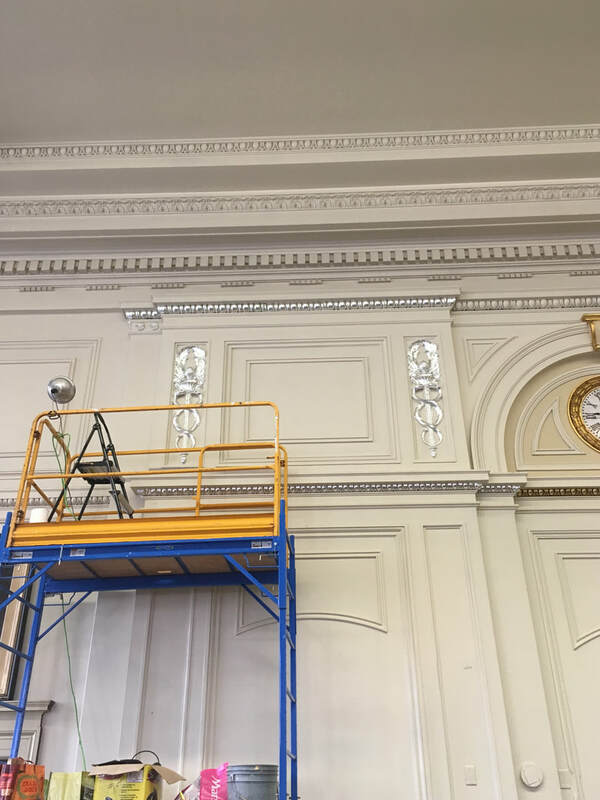 With the grant, we also received money to bring in an intern to help with the project, which has been incredibly helpful and has helped make the process much more efficient and safer for the quilts. This project has been a lot of fun to work on and has given us the chance to review the quilt collection, update records, and think more about the information contained within the collection. In the process, we’ve found incredible quilts ranging in size, pattern, color, age, and more. Quilts are artifacts that are both utilitarian and, in a trend that began in 1970s, seen as pieces of art, and it’s not unusual to hear of people investing considerable emotional and physical energy into making them. In years past, before the mass production of fabrics and improved transportation, fabric was expensive and people did all they could to save and reuse fabrics, which turned the quilts into not only usable items but repositories of memory as you could look at the quilt fabrics and recall that this came from your mother’s dress or that came from your uncle’s suit. The quilts in the collection were prized possessions that were used, repaired and used again to keep generations of Humboldt County residents warm. ​With the upcoming quilt exhibit, I’ve been thinking about how the Clarke quilts relate to the general Humboldt County community. Some of them were rather large quilts, up to 80-90 inches long and sewn by hand, and some of these particularly large quilts were made to raise money. It was an undertaking that was sped up (and was much more fun) when friends were involved and could help out with the process. Women could find support for their creative endeavors, appreciation for the hard work they did, and a space to share experiences, stories, emotions, and perspectives outside of the male gaze and social structure. There is also a story which made the local newspaper of how Susie Baker, a woman from Blue Lake and the author of the Susie Baker Fountain Papers housed at HSU, invited a group of friends over for “the ostensible purpose of tying a quilt intended, so it was said, for a church sale.” in 1915. When the group arrived for the dinner party that went with the quilt tying festivities, they found envelopes with the announcement that she was engaged to a Mr. Eugene Fountain of Arcata, which turned the social event into a celebration of a new phase in Susie’s life. 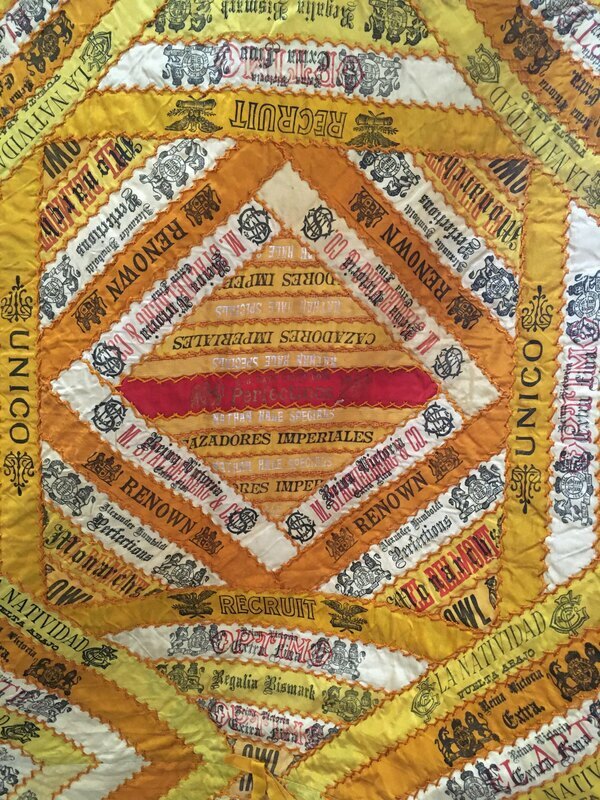 While the quilt tying is only passingly mentioned here, it served as a conduit for collaboration, as the women came together to work on the quilt which would benefit another community they shared, their local church. We have quilts from other communities, such as an unfinished crazy quilt top that was started to eventually be auctioned off to raise money for a local fraternal organization, but for some reason was never finished, and a quilt featuring embroidered signatures of community members from Blue Lake, Eureka, Garberville, Berkeley, Korbel, Arcata, and more that was thought to have been auctioned off to raise money for the establishment of a new Order of the Good Templars group in Blue Lake. More often than not, the makers of these quilts are unknown or unnamed. It’s a mystery, but you can still learn a lot about the women who made the quilts, and the period that the quilts were made in, even if you don’t know their names or their stories. Be sure to come by and check out Sewing Circles when it opens in July! ​Working in the archives is part treasure hunt, as we search through boxes for items for exhibits, blog posts, and places to put new donations. I find that it’s a lot of fun, partially because you sometimes don’t know what you’re going to find while you’re looking for something else. A few days ago, we came across a unique and fascinating find in the collections: a dress. We have almost 500 dresses in the Clarke Collections ranging in colors, time periods, shapes, sizes and uses. Some are handmade, others are machine made, some are two pieces like Victorian dresses, others come in one piece. This dress was in two pieces, a bodice and a skirt, with internal boning that clasped at the front. It was probably for a woman who was about 5 feet 3 inches tall, which was a relatively common height at the time. The neckline was made up on long strips of silk that flowed loosely and long strips of silk ran down the full length of the skirt. The silk was not any regular kind of silk though, but cigar ribbons, which had been sewn in layers onto a tan colored slip. Cigar silks were ribbons that were used to bundle cigars together during processing. Smoking cigars was a popular past time during the Victorian period, and women would oftentimes collect the silk ribbons for their sewing, creating beautiful quilts from rows and rows of the silks. Cigarettes came with coupons that could be redeemed for silk pieces as well, known as cigarette premiums, which included the brand name and, oftentimes a beautiful lady or some other popular design like flowers. 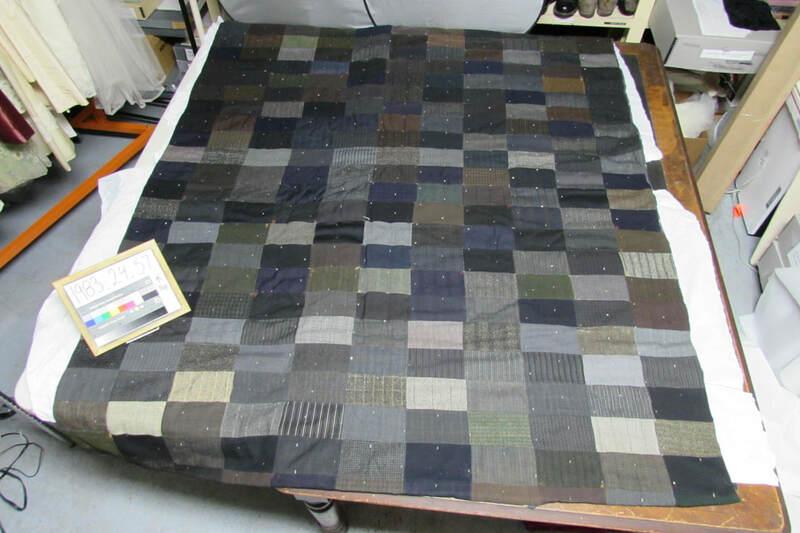 Collecting premiums was happening around the same time as a rise in popularity of the Crazy Quilt, which had women searching for scraps of pretty fabrics to add to their ever-growing patchwork quilts. These silks were oftentimes incorporated into other quilts, or became quilts in themselves. This dress, however, was an unusual find. We don’t have any information on who donated it to the museum, who wore it, or why it was made. We haven’t been able to find much in terms of other dresses like this being made. Was it made to show off a silk collection like the quilts were? 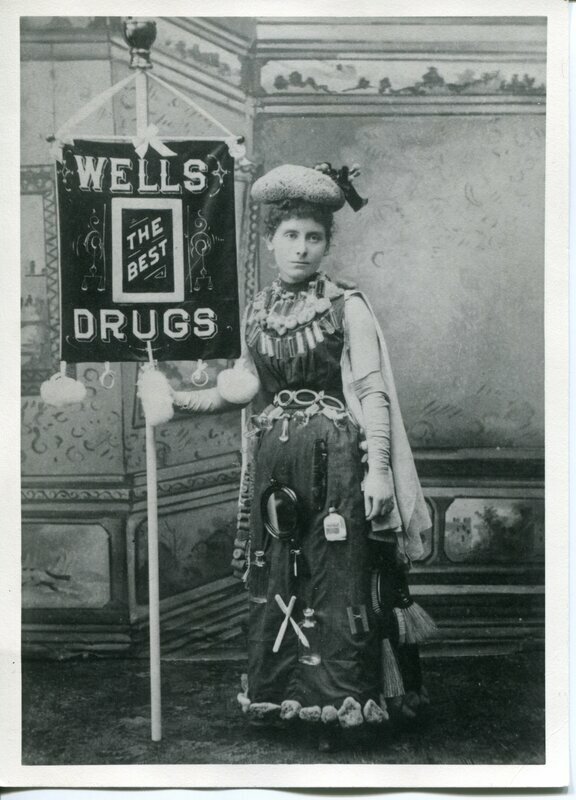 Or to advertise cigars sold locally maybe, in a way similar to this photo of a model for Wells Drugs decked out in a variety of items sold at the store? We may never know. 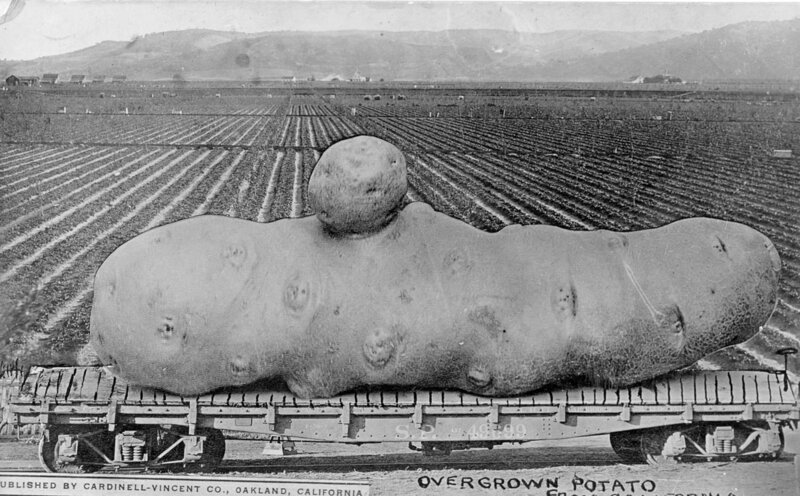 Welcome to part 2 of our blog series on early industries of Humboldt County! This week, we'll be taking a closer look at the earliest industries in the county-natural resource extraction. These are the industries that initially brought settlers to the region. In 1849, shouts of “Eureka!” could be heard along streams and in mines across California. Gold was discovered in the Trinities by adventurous land-travelers a year earlier and it would only be about a year after the Josiah Gregg expedition landed in Humboldt Bay in 1849 until a small town on the bay would take “Eureka” as its namesake. A town sprung up alongside the bay, serving as a landing point for newcomers arriving by ship. 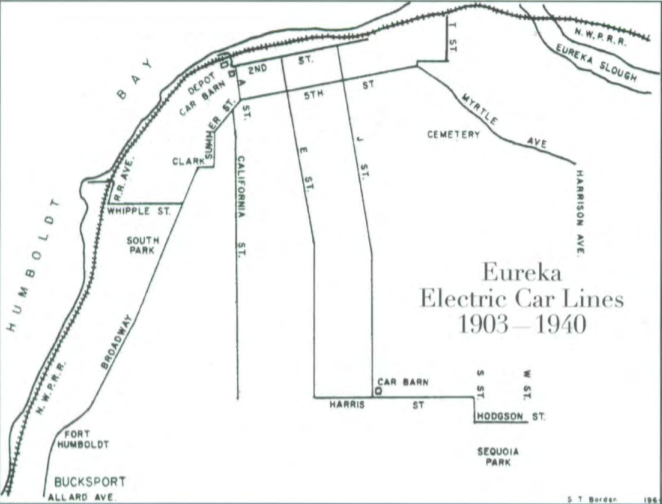 Eureka wasn’t alone, however: Bucksport and Arcata (then called Union or Union Town) established themselves as landing points where miners could stock up and head north to the Trinities to strike it rich- at least that was their plan. 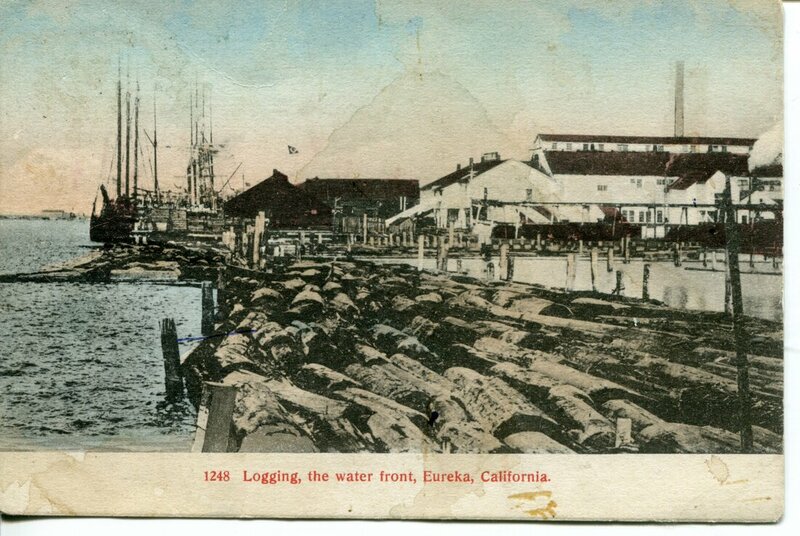 At these landing points, port towns like early Eureka, the waterfront developed in a wildly colorful locale, stocked to the brim with saloons, supply stores, docks, and gambling halls. These port towns supplied newcoming miners with everything they needed (and didn’t need) at a high cost. Once they were stocked, the miners could start the journey to the goldfields located along the Trinity and Klamath Rivers. Some eager miners also tried to pull gold flakes from beach sand en masse, most notably Gold Bluffs Beach in the present day Prairie Creek Redwoods State Park. Those efforts failed- but the name stuck. Early mining consisted of gold panning, the stereotypical miner crouched by a river running sand through water in a pan to pick out the gold within. After the easily accessible gold was mostly harvested, hydraulic mining took over, employing formerly solo miners into mining companies, which could afford the expensive equipment required. The process of hydraulic mining, created during the Gold Rush in California, consisted of shooting large quantities of highly pressurized water at hillsides, releasing gravel which was then sifted through to find the gold within. 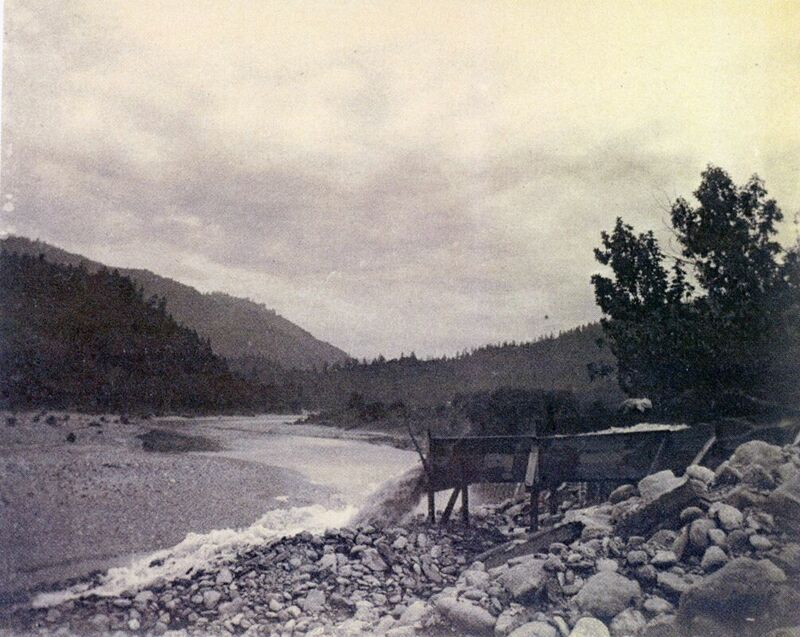 The process led to high levels of gold being harvested as more gravel was processed by fewer people, but the process also led to the demolition of whole hills, an increase in rivers filling with sediment causing flooding, changes in river courses, and irreparable landscape damage. 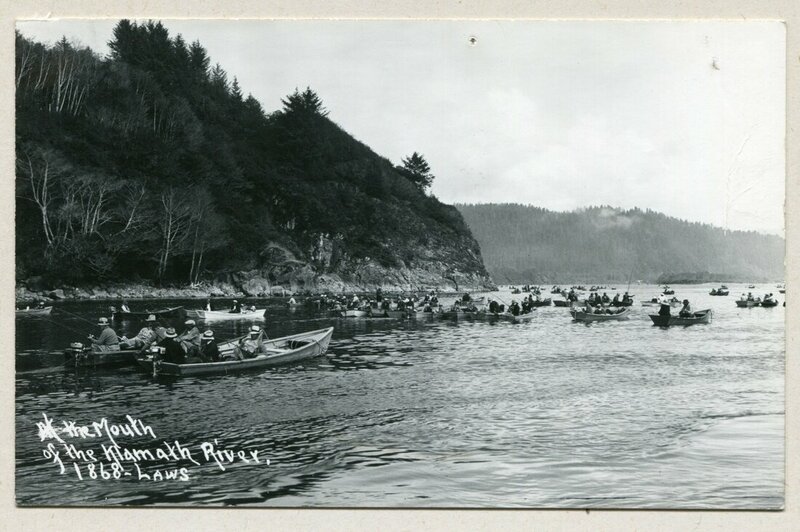 On the Klamath River, the flooding of sediment impacted the river’s legendary salmon runs as well. Mining was carried out by people from around the world who worked, oftentimes uneasily, side by side. Chinese miners were employed in the lowest paid, most menial jobs, becoming an integral part of the mining history across California and in Humboldt County. While they were detested by a large majority of other workers, they worked hard, rarely were sick (due to boiling their water for tea and rice and rarely drinking alcohol), and followed directions. They were employed digging water ditches in mining centers like Trinity Center, where 200-500 Chinese were employed at Coffee Creek Ditch. 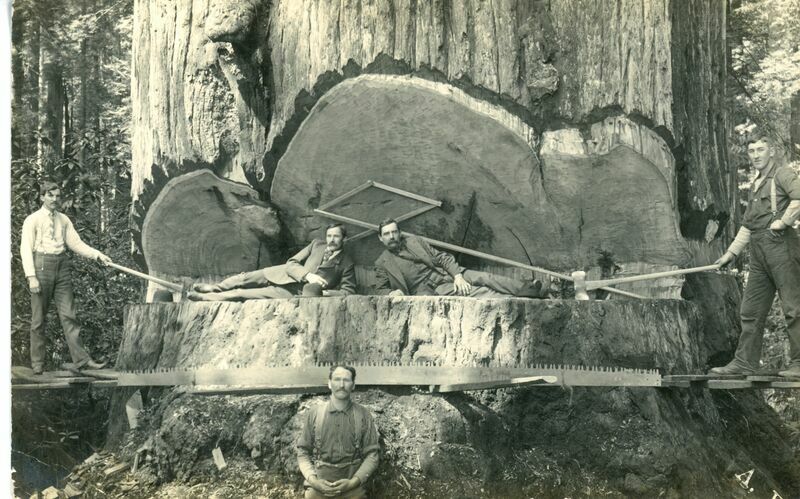 Early settlers to the area did log the area immediately adjacent to Humboldt Bay in order to build their homes, however, early logging efforts focused on smaller trees, as tools brought from the East were built to handle smaller trees. 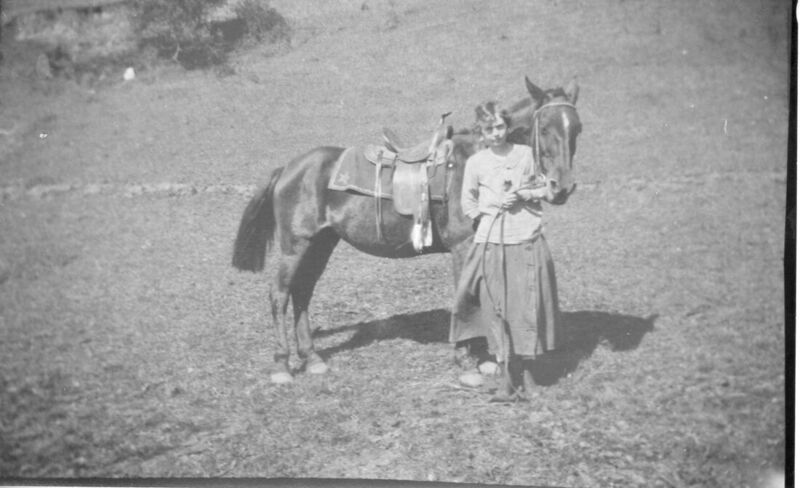 Tanoak was popular in many areas, with the bark used to tan livestock hides. Bundles of this bark were stacked onto carts and carried by wagon trains along early roads in Humboldt county to port towns for export. Logging tools that traveled to Humboldt county with immigrants and merchants were not designed for the redwood trees of unusual size in Humboldt County- in the occasion that a large tree or stump had to be removed, loggers would drill holes into the tree, pack it with dynamite, and blow up the tree. It was a matter of time until advancements were made to capitalize on the giant trees and endless forests. Innovations, management expertise, and luck under the guidance of John Dolbeer, William Carson, and other enterprising men led to the construction of mills around Humboldt Bay. 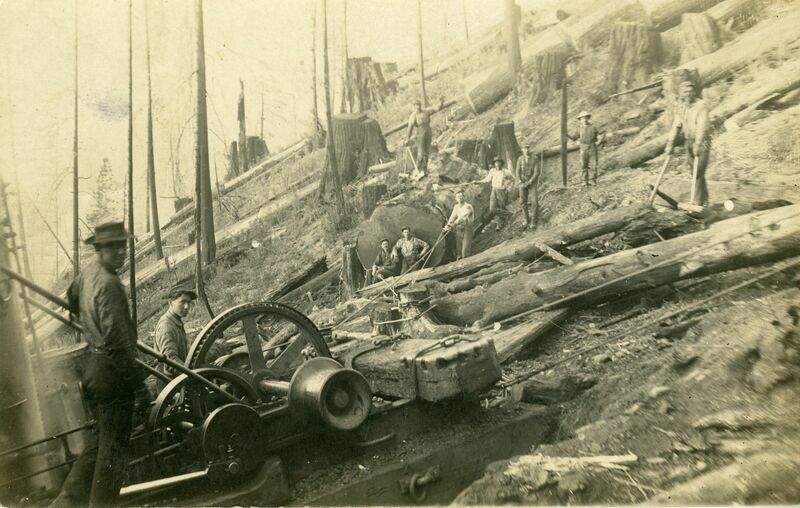 New inventions and technologies invented in Humboldt County like the double band saw, Steam Donkey, and Bull Donkey revolutionized the logging industry on the whole and allowed logging companies to speed up all parts of logging and milling, leading to more trees processed at lower costs. Logging companies forayed into the shipbuilding industry as well, to reduce their shipping costs by operating their own ships built from their own timber. With the addition of railroads locally and railroads later connecting Humboldt County to markets in San Francisco, the local and international markets boomed with redwood. One often overlooked and short lived industry was oil drilling. 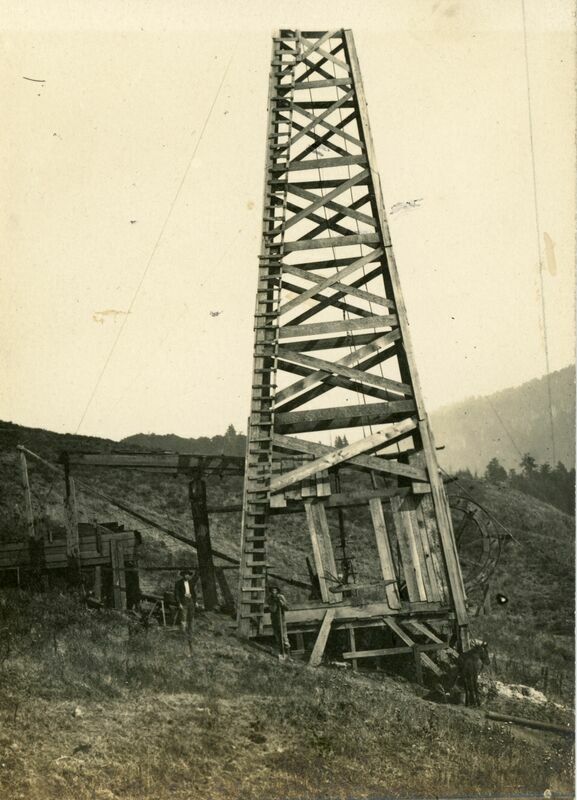 Oil in Humboldt County was found as early as 1857 but was overshadowed by the rush to the gold mines, which offered the tantalizing chance of making a lot of money with low overhead. It wasn’t until the 1860s that oil was becoming nationally valuable, warranting locals to begin investigating the possibility of drilling for oil in the area. 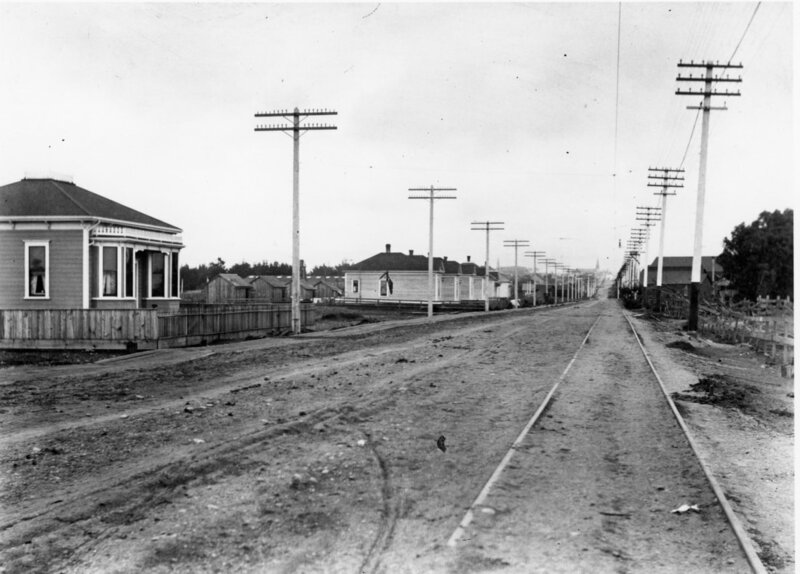 The story goes that Petrolia, as the area was now known, had oil that was such high quality, it needed little to no refining, making it a potential goldmine for drillers. It wouldn’t be a quick, cheap, or easy process though. Oil drilling requires a large investment in capital to purchase supplies and construct the infrastructure needed to drill. Humboldt County may have been rich in resources, but not money-or wealthy investors. Access to coastal, southern Humboldt County was difficult at best and impossible at worst, making it nearly impossible for the industrial supplies needed to construct and maintain the oil drills to get to Humboldt County. Transporting the oil out of rural southern Humboldt was also a challenge. 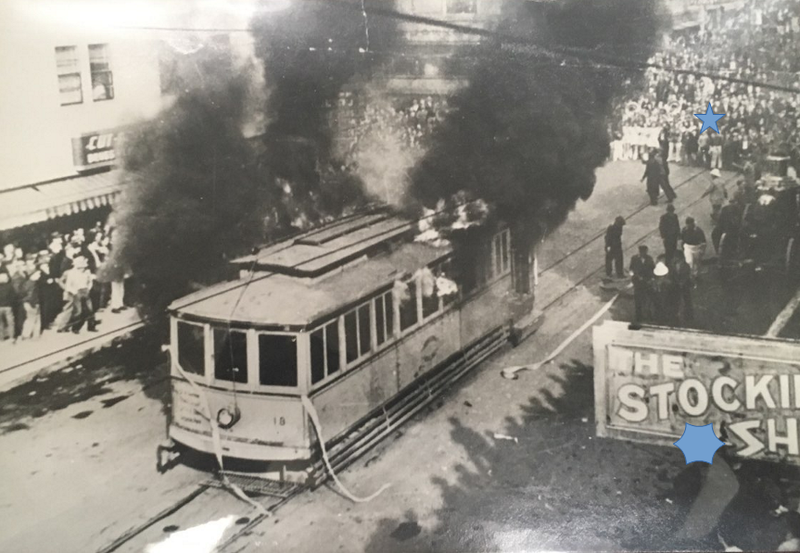 Certain ships could get to the area, but as the steamship became a more popular mode of transportation, many companies refused to ship oil due to its flammability. A backup option was to attach barrels of oil to the sides of mules and send them on overland routes, but it was costly, inefficient, and dangerous. Drilling season was also limited due to rainfall flooding the oil wells. Other regions that drilled for oil were able to out-compete Humboldt County oil, bringing the short-lived oil industry in Humboldt County to an end in 1866. Later attempts were made to revive the industry, but none succeeded due to similar issues, namely cost and transportation. 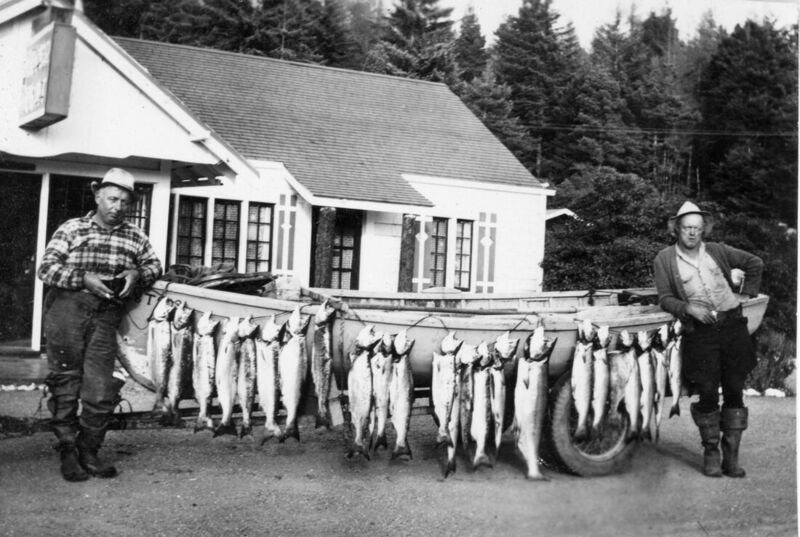 Fishing became a popular industry as settlers established claims and began building their lives along the rivers of Humboldt County. In the first commercial fishing season on the Eel River in 1853, 250,000 pounds of salmon were harvested. There were no limits on take, so people strung nets across the river and hitched horses to the nets to harvest incredible amounts of fish. 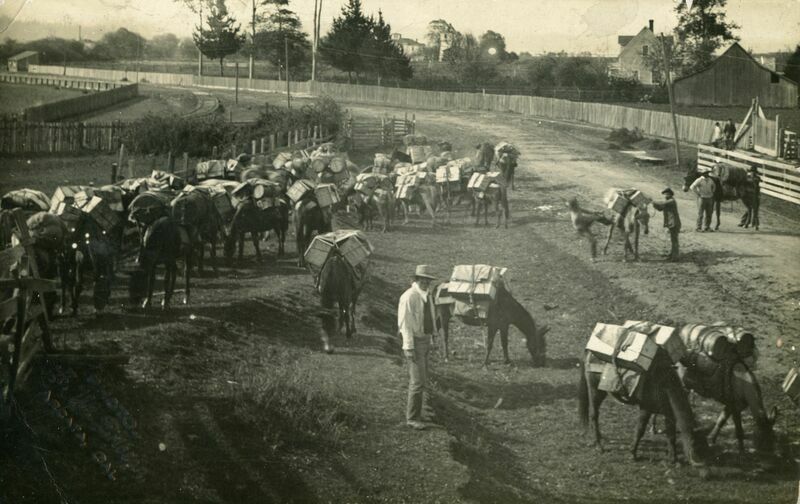 Companies formed to package and process the fish, which was transported around the country. Whaling was of interest around the Humboldt Bay area, with records showing the Captain H.H. Buhne owned a whaling ship and would go whaling on occasion. Whaling, however, would peak in popularity in the 1920s and 1930s. 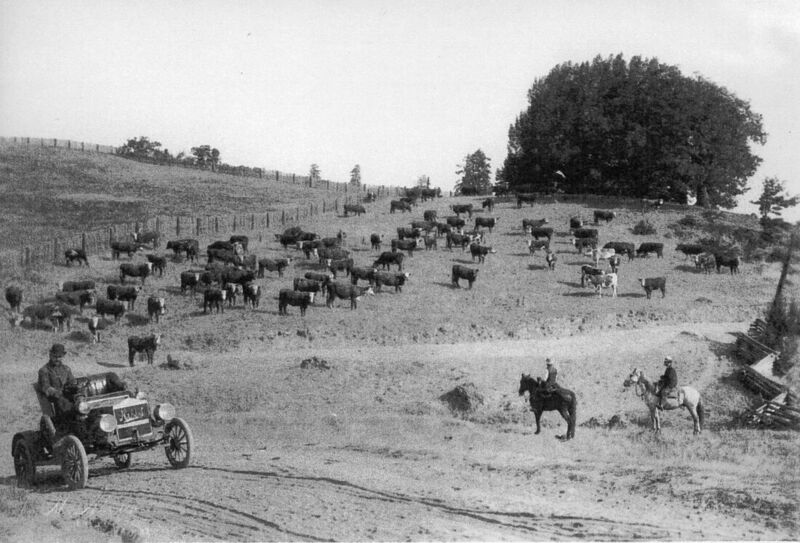 The natural abundance of the region that became Humboldt County attracted early settlers to the region, tying the early history of the county to the larger history of California and the West as a whole. The towns themselves boomed and busted with the economies, but people began to settle in, starting their families and settling into industries like agriculture, which included farming and raising livestock. We’ll look more into these industries in our next post! The museum’s newest Exhibit is called From Boom to Bust and Back: Early Industries of Humboldt County, 1850-1915. It features 3 areas focusing on defining types of early industries in Humboldt County: Natural Resource Extraction, Agriculture, and Commerce. Natural Resource Extractions covers industries that made their money from raw materials- mining, logging, and fishing. These industries were typically what brought people to Humboldt County in the first place. Early settlers sent word back to friends and family of the ‘untapped’ bounty of resources in Humboldt County, which attracted more people to settle the area. 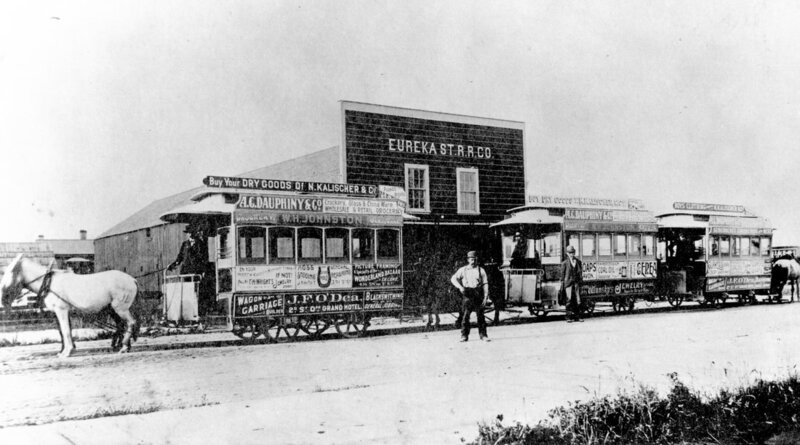 The Gold Rush in California brought people to the West Coast in droves in 1849 and 1850 and, when the mining claims didn’t work out, some left while others settled and got into other industries to make a living. Logging prospects brought a number of people from Canada and the northeastern United States to work in logging industries and bountiful fishing opportunities brought in more settlers from Scandinavian countries. 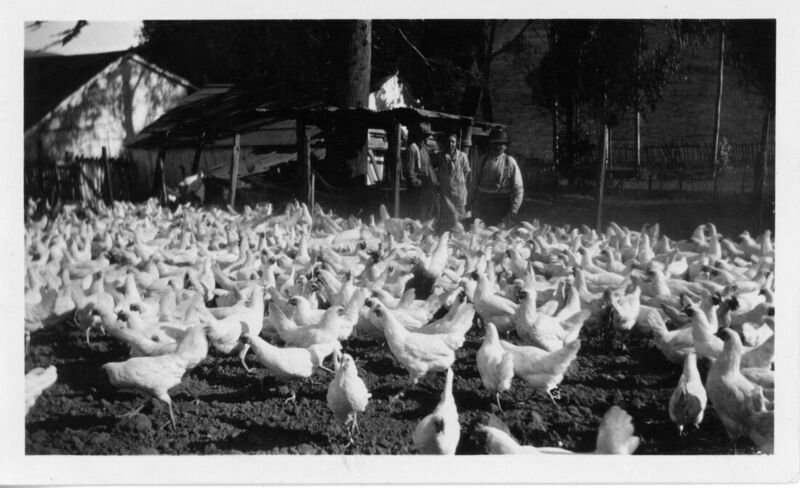 Agriculture includes farming and raising livestock, which have long been staples in Humboldt County’s industrial history. Farming communities established in this period exist in the present, in places like Ferndale, although preferred, money making crops have changed over time due to cultural shifts and blights. 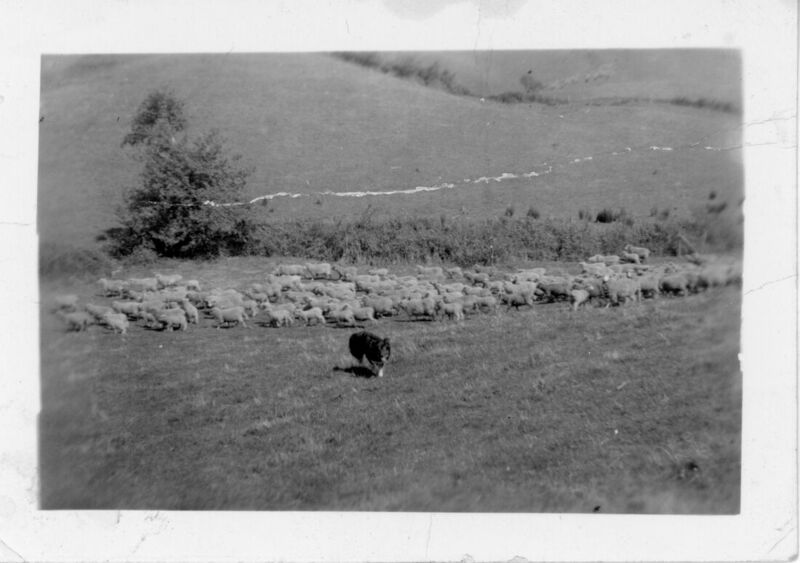 Raising cattle and sheep specifically have been longstanding industries in certain parts of the county. Commerce is an industry that is frequently overlooked- in the early days of Humboldt County and California commerce was where the rags to riches stories often took place. Commercial leaders would got their start by buying goods from San Francisco and bringing them into Humboldt County to sell to miners and other residents at a high markup. This wasn’t unique to Humboldt County, and this practice was common around mining areas across California. 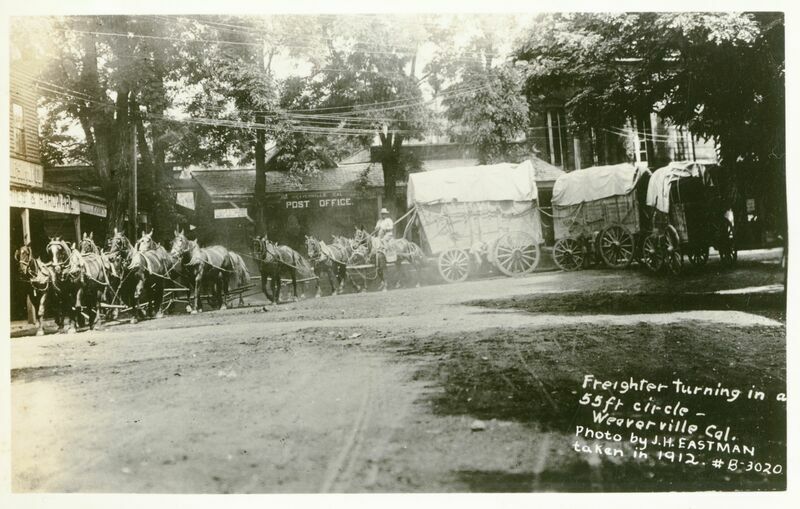 Commerce also includes the transportation of goods into and around the county, a feat that was not for the faint of heart. 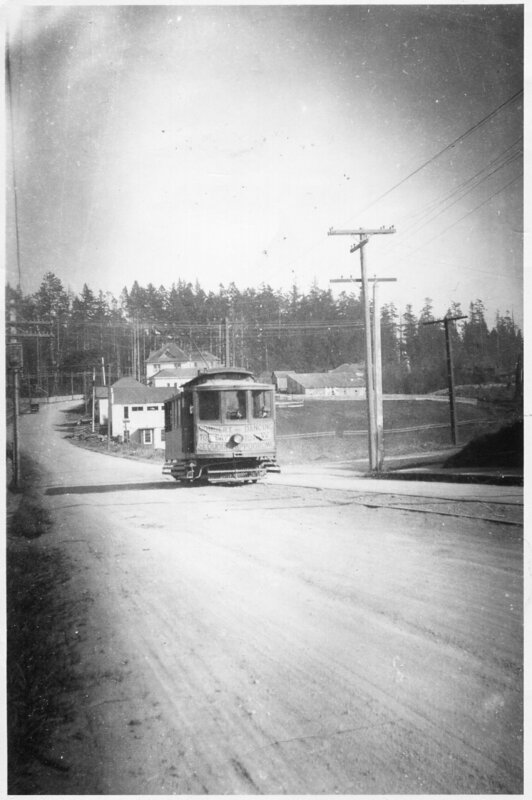 Prior to 1914, transportation in and out of the county was via ship or overland routes, both of which had the possibility of being incredibly dangerous due to weather. 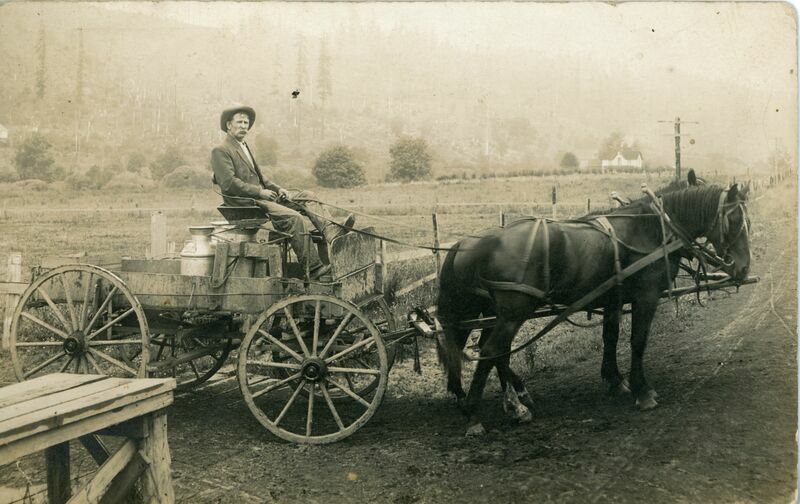 The Gold Rush and subsequent years brought Americans and international immigrants to Humboldt County, establishing a culturally diverse region. 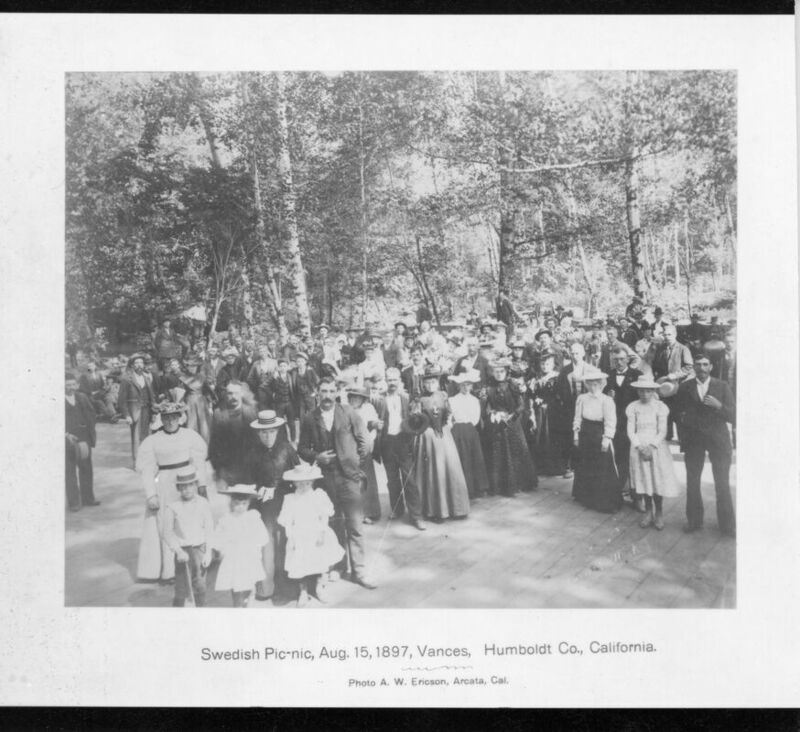 Dutch, Portuguese, Chinese, Finnish, Norwegian, Swedes, Irish, Italian and Canadian immigrants lived and worked in Humboldt County, concentrated in certain industries and areas, allowing for micro-communities of individuals from similar backgrounds to share cultural practices and language. Many immigrants resumed trades they had learned in their home countries which frequently existed in climates very similar to Humboldt County. Part of the draw was also the novelty of settling in a new, ‘unexplored and wild’ place, with the chance to reap wealth from the area and make a living to support one’s family. The exhibit explores the three industries through presentations of work processes and tools, and the stories of local individuals who worked in the industries. They are a small sample of those that made a life in Humboldt County’s early days and those that navigated the booms- and busts- of the local economy all those years ago. 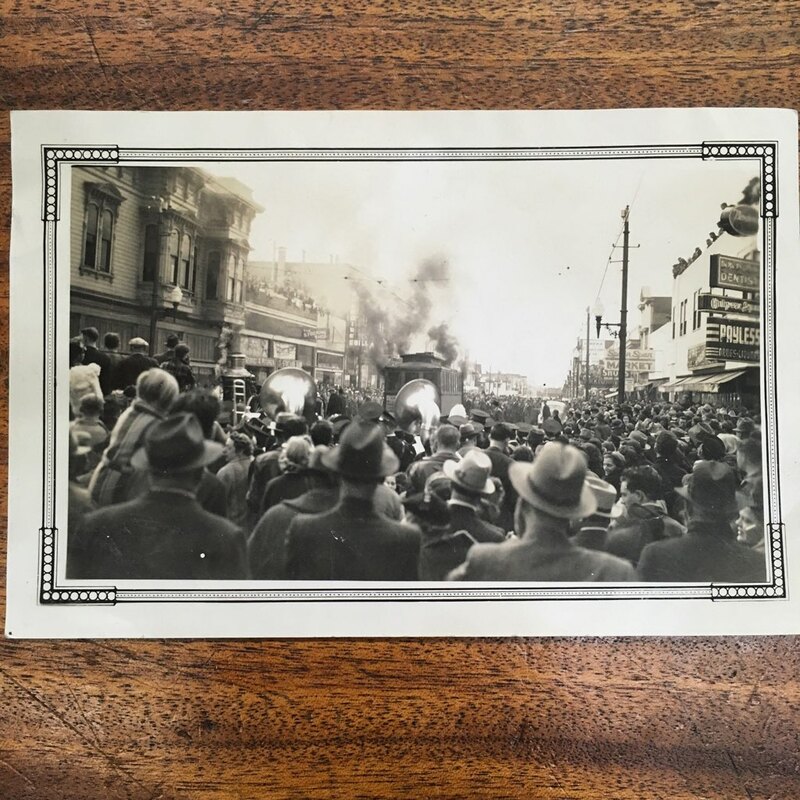 This is part 1 of a series on early industries of Humboldt County, stay tuned for part two, where we'll be looking closer at natural resource extraction industries including mining, fishing, logging, and oil.